Coming from Alghero or Sassari, you leave the SS131bis (Ittiri-Thiesi) at km 16 to take a dirt road to the southwest with directions “Domus de Janas S’Ena de Cannuia”. You follow the road for 1.4 kilometers until its end, in correspondence of a wide open space useful to park the car. In this area the volcanic forms are so evident and numerous that they hit the general Alberto Della Marmora already in 1857, which defined these mountains the Sardinian Auvergne, comparing it to the French region where they insist numerous volcanic phenomena. The hiking possibilities of this region are enormous and the paths, although often not very clear or marked, are easy and affordable for everyone, even the less experienced. One of the most suggestive itineraries develops in a ring around Monte Torru, along the colorful ignimbritic rocks, in a natural area not far from Sassari and from the coast of Alghero. From the parking lot, we start in a southerly direction, at the end of the open space, where it will be necessary to open an iron gate. The wide mule track is detached from the dry stone wall to the left. A little further on you pass a couple of wooden gates and descend along the valley that we will soon leave at a crossroads with a vague trail, to maintain altitude and then, to the right, slightly up to the pass between Mount Cheia and Mount Longos at an altitude of 590. Then descend towards the intersection of the two impluvi that give life to Riu Badde Mela and reach the valley floor, in correspondence of a couple of isolated trees. Follow the left impluvium and on the highest point of the saddle you can see on the left a small road that climbs up the summit of the Sea Lepere. 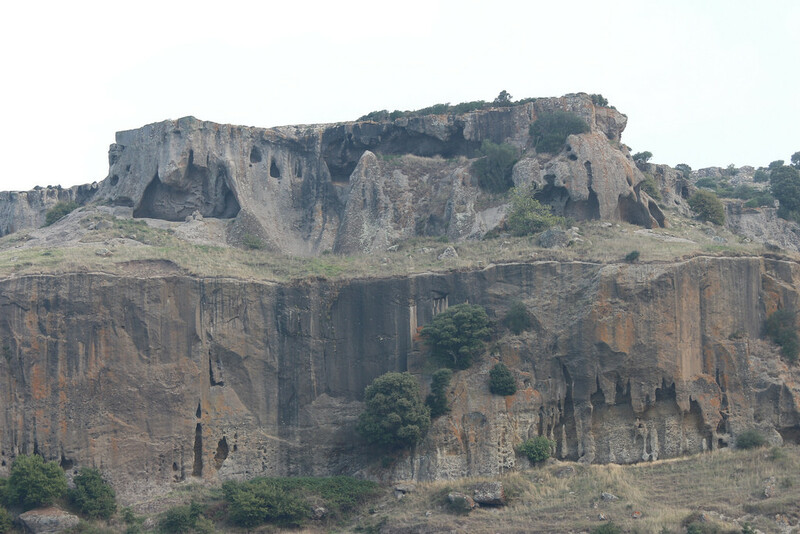 At the top, proceeding to the right, you look out over the Monte Torru relief. 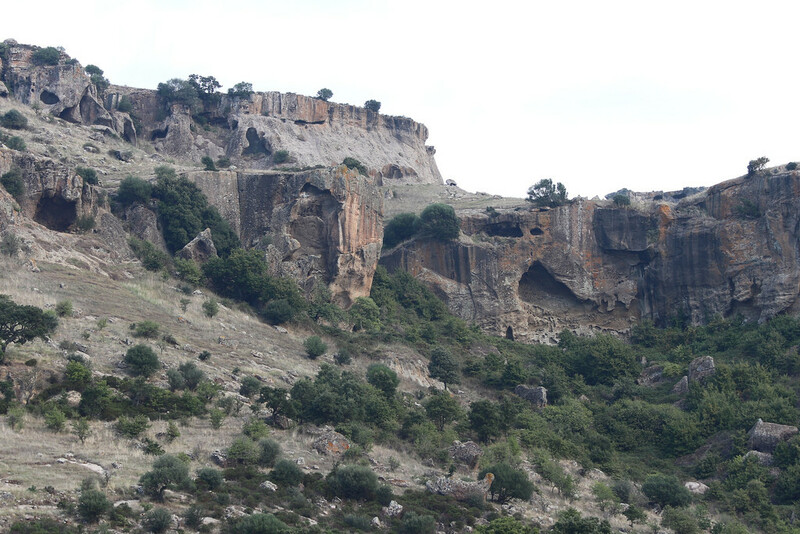 From here we descend by rocks, we cross towards the west and we descend into a vast amphitheater where the top and the Nuraghe del Torru stand out. On the right a wide gap between the rocks allows you to climb to the top of the mountain at 622 meters, where you can enjoy a spectacular view. When you go back down, you return to the rocky saddle with the wooden sign from which you take the north-east direction until you reach the lower part of a grove of downy oaks. After about two hundred meters the path bends with greater decision to the right and goes up the orographic left of a wide valley. The trail, not very evident, leads to a small spring with a tank carved into the rock on the side of a road. Follow this for a hundred meters until you find a deviation on the right that allows you to cross the valley and pass on the opposite side, at a rocky plate. The rest of the path does not pose big doubts, since it is necessary to remain in altitude crossing north and along the western walls of Mount Longos. You arrive at a dry stone wall to climb over, not far from an isolated cork. Beyond the wall it bends to the right, descends from a low rocky step and climbs up the Badde Coss keeping to a height on a trail of path now more evident. 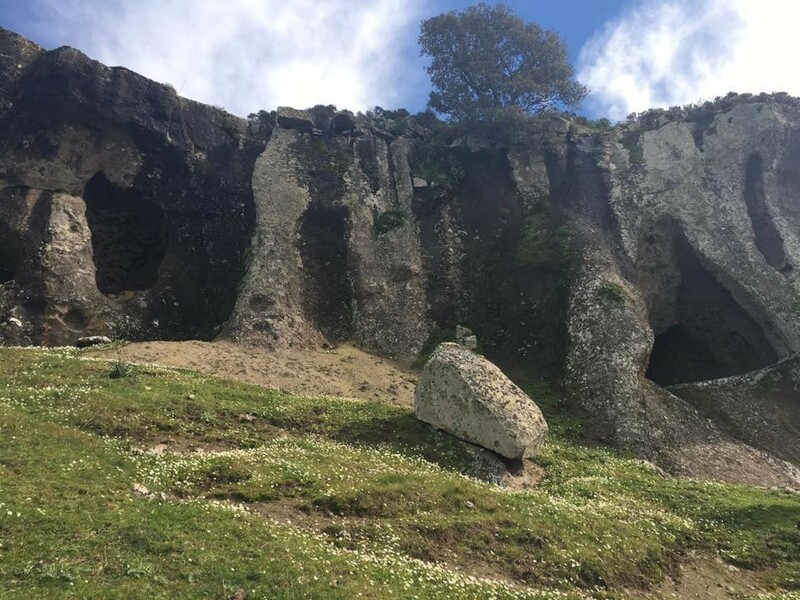 After about two hundred meters you will cross the gravel (muddy in winter) and continue slightly uphill towards the east in the direction of a worked wall, and then go to its left, in correspondence of a passage under the Monte Deu. We are now on the side of the rocky cliff that houses the Domus de Janas of S’Ena de Cannuia.